The timeframe was recommended by a panel advising the Japanese government on its long-range climate policy, but the proposals have already attracted criticism from environmental advocacy groups for vagueness and lack of ambition. Japanese Prime Minister Shinzo Abe, who has signaled he wants to play a leadership role on climate change, is due to host G-20 leaders for their next summit in Osaka in June. The government is working to finalize its policy in the lead-up to that event. As part of the Paris Agreement process, Japan has already committed to cut its emissions by 26 percent by 2030, compared with 2013 levels. In the longer term, the country has a goal of reducing emissions by at least 80 percent by 2050 (with the baseline year unspecified). The recommendations from the panel included working vigorously on the 80 percent goal by 2050, and to achieve a “decarbonized society” as early as possible in the second half of the century. This term refers to achieving a balance between anthropogenic emissions and the amount removed by greenhouse gas sinks. “Global action and disruptive innovation are essential to address climate change,” said a summary of the panel’s recommendations provided to international media. The panel was not prescriptive about the way to reach the goal but emphasized the need for innovation. It cited examples of potentially disruptive innovation as carbon capture and storage (CCS); carbon capture and utilization (CCU); next-generation battery technology; hydrogen production, storage, and utilization; space solar power; next-generation geothermal power; advanced nuclear power; ocean current power; and advanced wind power. Incremental solutions would not be enough to reach the 80 percent emission reduction target by 2050, hence the talk about disruptive innovation, according to a Japanese foreign ministry official who addressed a press briefing. He spoke to international media at the Foreign Press Center Japan on April 12 on the condition of anonymity. The panel called for renewable energy to be embraced as a major power source and a reduction in emissions from coal-fired power plants. Even though several major fossil-fuel projects have been canceled over the past few years, new coal-fired power plants with total capacity of 15 gigawatts remain on the books – either as proposals or under construction – according to the Kiko Network’s Japan Coal Plant Tracker. The Japanese government was warned by a different panel last year that its ongoing promotion of coal-fired power was creating a “bottleneck” in international climate talks, as reported by The Diplomat at the time. That’s the direction that they have shown, they have also pointed out that there is a possibility of CCS and CCU technologies getting into operation. It’s not been commercialized yet, but if it enters into play many fossil fuel-powered plants would achieve a significant reduction. Regarding the omission of a clear recommendation on implementing a carbon price to drive emissions reductions, the official said the panel had noted there were many viewpoints to be considered but had not been able to reach a consensus on that issue. Environmental campaigners see the long-term strategy as a key test of the government’s seriousness in tackling climate change and have called on Tokyo to increase its level of ambition. The Kiko Network, a climate action group that grew out of Japan’s hosting of the climate conference that adopted the Kyoto Protocol in 1997, welcomed the focus on achieving a decarbonized society. However, it said it was concerned the recommendations reflected an inadequate level of ambition and concrete measures. 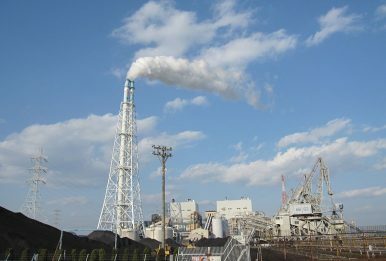 In a statement, Kiko Network President Mie Asaoka said the current construction plans for coal-fired power plants across the country would “lock in enormous amounts of greenhouse gas emissions long into the future.” It was also a concern that the recommendations did not call for a halt in Japan’s overseas assistance for coal power. “If Japan’s long-term strategy fails to include a major policy shift away from Japan’s promotion of coal power, it will be extremely inappropriate as a long-term strategy, and amount to nothing but a show,” Asaoka said. She also criticized the embrace of “several problematic technologies that are still far from being practical” such as CCS, CCU, space-based solar and next-generation nuclear power, saying it was “a serious concern that these technologies are being emphasized as if they could solve everything.” That focus, Asaoka warned, could delay urgent action. We do not dictate the future option, every future option up to 2050 … but I don’t think that’s empty at all. And they have shown that there are many options and all options should be aimed at decarbonization, and that is clear enough for us when we formulate specific policies. The panel also mentioned plans to decarbonize manufacturing processes, including the steel industry’s goal to achieve “zero-carbon steel” and a separate policy of realizing “well-to-wheel zero emissions” in the automotive sector. The panel endorsed efforts to limit the global temperature increase to 1.5 degrees Celsius above pre-industrial levels, as outlined in the 2015 Paris Agreement. The government has started an inter-agency consultation process on the recommendations and hopes to publish a report in late April or early May for public comment, the foreign ministry official said. The aim is for the government’s policy to be announced by the time the G-20 environment and energy ministers gather for a meeting on “Energy Transitions and Global Environment for Sustainable Growth” in the central Japanese city of Karuizawa in mid-June, ahead of the main G-20 summit later that month. Abe hopes the policy will show Japan’s willingness to “take the lead in global efforts” to protect the environment for future generations – but it seems many of the details remain to be filled in. Japan’s Opportunity to Take a Leadership Role on Climate ChangeAbe’s Coal AddictionWhy Japan Is Rethinking Its Energy DiplomacyUS-Japan Trade Agreement Negotiations: Why Now?Japan’s New Imperial Era: What’s in a Name?